I'm thinking Car 3 is at fault. Car 1 was already making the left, and I believe he is correct about the first to arrive at the intersection. 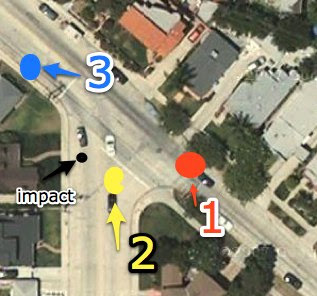 And car 3 should have seen car 1 coming - even if he thinks he has the right of way he should stay put if it will mean avoiding an accident. Right doesn't trump left. Especially when left got there first. That seems like a weird argument to me.